You classify product costs as inventory, an asset on the balance sheet, until you actually sell the product. Suppose your company spends $10,000 on direct materials, $3,000 on direct labor, and $6,000 on overhead to make 100 gadgets during the year. Total product costs in this scenario equal $19,000. Classify the costs of making these gadgets as inventory on the balance sheet until you sell them. All other costs are considered period costs. This category includes selling and administrative expenses. Subtract these costs from revenues on the income statement when you get the benefit from them. For example, suppose you pay salespeople $10 in commission for every whatchamacallit they sell. If they sell 30 whatchamcallits, then they must subtract $300 in sales commission expense on the period’s income statement. Think hard before classifying certain costs as product or period. 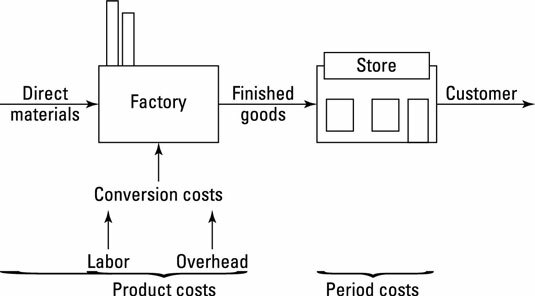 Classification depends on the purpose of the cost: If you need it for manufacturing, it’s a product cost. Otherwise, treat it as a period cost. For example, classify depreciation on a factory as a product cost. However, depreciation on the headquarters’ office building is a period cost. Similarly, paying employees working in the factory is a product cost (they’re usually direct labor); however, the cost of employees working in a sales office is a period cost.